City Motion to define Kits & WPG as a transit corridor planning area goes back to council before April 30. Find out how this could result in provincial/TransLink involvement in land use planning in Kits & WPG. The West Point Grey Residents Association is opposed to the recommendations in the above reports and requests that Council receive the reports for information purposes only, not as policy. As outlined in the letter from the Coalition of Vancouver Neighbourhoods (CVN), of which we are a member, we do not support the proposed Broadway subway, either to Arbutus or an extension to UBC. The CVN letter is linked below for reference. In addition to the points made in the CVN letter, we are specifically concerned with the impact that a subway extension to UBC would have on the development in West Point Grey given that our entire neighbourhood would become a frequent transit development area. This would mean substantial increased tower development at the Jericho Lands, West 10th Avenue, and across West Point Grey. We do not see this as sustainable or necessary to meet growth. It would only support the unaffordability driven by global capital. The assumptions in the reports regarding ridership, growth projections and level of opposition/support are entirely inaccurate and are not fact-based. There are more affordable transit options that would allow broader applications across the citywide arterial grid for electric trams and trolleys that would better serve the city at large, rather than putting all the transit funding for the next generation into only one unsustainable subway corridor. Location: WPG United Church @ 8th Ave. & Tolmie St. Please come and bring your neighbours! Thank you for sending your letters and speaking to council. Council passed the rezoning for all RS, Including WPG. There were 302 letters and +7000 petition opposed. 73 speakers. They rezoned all RS (single detached) to duplex, allowing up to 4 units per lot. This includes 2 strata duplex units and 2 secondary suites or 2 lock off units (with waived onsite parking requirements). There has been no public consultation process and it undermines all neighbourhood-based planning, including the WPG Community Vision that council approved in 2010. If you have not signed already, please sign and pass it on. Now over 7100 and growing! Need to make this an election issue. May 27 WPGRA Town Hall Meeting: Thanks to MLA David Eby, the presenters, moderator, all who attended and the volunteers who made our event a success. The Jericho Hill Gym was packed to capacity, including the upper balconies, at over 900 in attendance . With the exception of only a few people, the overwhelming opposition to this tax was clear. MLA David Eby committed to taking this message, including the proposed alternatives, back to the government and Minister of Finance, Carol James. Most cannot afford this tax. There are better options from the provincial tax base to cover needed revenue for schools rather than encroaching on the municipal tax base of property taxes. The BC Government has proposed a huge surtax onto property taxes for those assessed at over $3 million. It would substantially affect the City of Vancouver for both owners and renters, covering more properties over time.This would eventually affect everyone. Be informed about this precedent and make your voice heard. This is the letter sent to the province from the West Point Grey Residents Association and other information on the surtax below. We are still accepting surveys from the community as per below. The Jericho Lands planning process has been delayed due to the owners’ focus on the Heather Street Lands in the Cambie Corridor. However, consultation on the Jericho Lands may start later this year 2018 after the Heather Lands planning is completed in the spring. So please complete your survey now if you have not already. Thank you. Redevelopment of the Jericho Lands, which are an integral part of the West Point Grey (WPG) neighbourhood, has the potential to transform the local community. A City of Vancouver planning process for both provincial and federal portions (as shown below) is expected to get underway in coming months. 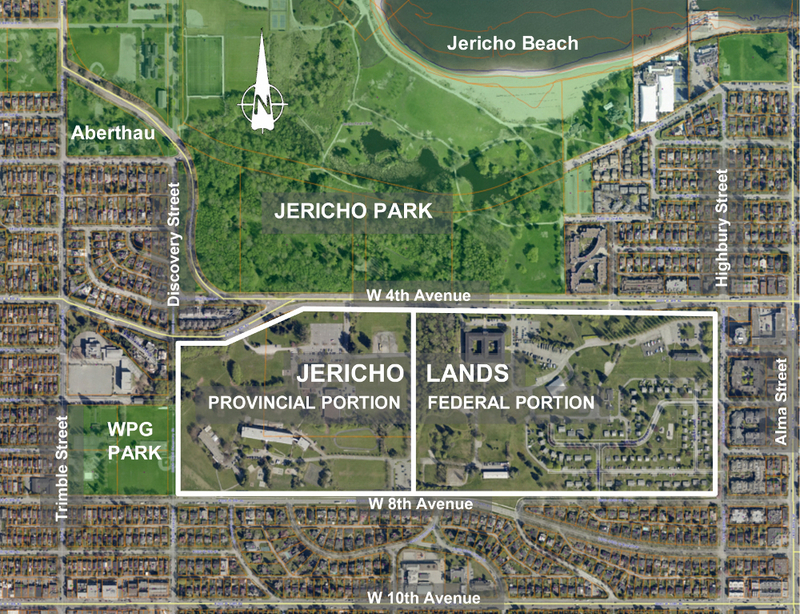 Consistent with the WPG Community Vision, approved by the City of Vancouver in 2010, local residents need to give early input to guide the Jericho Lands planning process. The following survey is intended to help the West Point Grey Residents Association (WPGRA) represent local perspectives. The Jericho Lands are shown outlined in white above. Both the provincial side (on the left) and the federal side (on the right) are under consideration for development planning. When complete, save a copy and email it to us at info@wpgra.ca. For descriptions of housing types continue here. West Point Grey Residents Association is a non-profit society that is volunteer based. Please donate to support initiatives to engage the community. Thank you.